Welcome to 2018 - 2019 Torch Club page! TORCH CLUB REGISTRATION NOW OPEN! Torch Club is a leadership group and service club for 6th, 7th and 8th grade boys and girls from Easton and Redding. 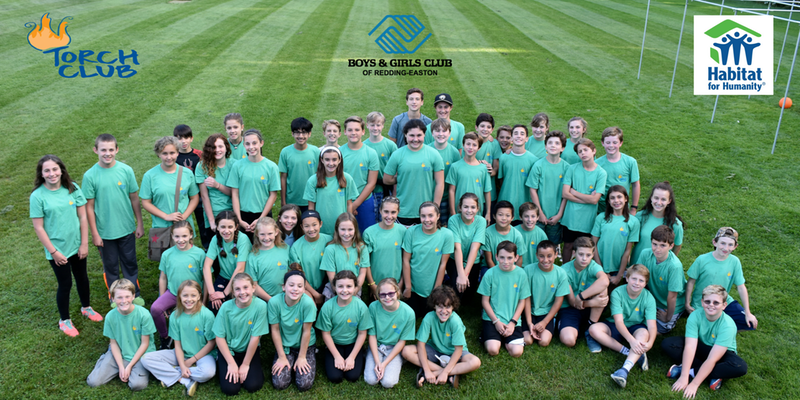 The goal of Torch Club is to strengthen 21st century leadership skills by teaching its members to learn how to enrich their lives and the lives of others through community service projects, leadership and by demonstrating good character. 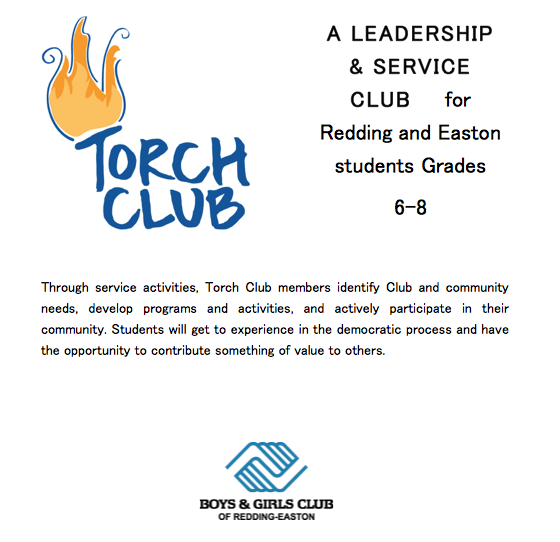 Torch Club members will elect officers and work together to implement projects in four focus areas: (i) service to the Redding Easton Boys and Girls Club and our Community; (ii) education; (iii) health and fitness; and (iv) social recreation. Torch Club meetings will be held once a month on Saturday afternoons, between September and May. Community Service Projects, which are required for successful completion of Torch Club, are in addition to the monthly Torch Club meetings. All Torch Club Requirements must be completed by May 11, 2019. See below for details. I will lead by example and be a positive role model for others. I will take responsibility for my schedule. I will be responsible for my actions, including what I say and do to others. I will display good sportsmanship and play by the rules. I will respect the Club, staff, and fellow members. I will strive to do my very best at all times. Cost: $155* for current BGCRE members. (Cost includes t-shirt and food). *Scholarships are available please contact Joseph Dolan at 938-3166 for more information.